I wasn’t sure if I had the energy to watch a movie last night, so I figured I’d put something entertaining on which wouldn’t cause me any guilt should I pass out halfway through. I don’t think that’s the sort of endorsement they put on the poster. I watched GONE IN 60 SECONDS (2000) on 6.22.12. It was, roughly, my fifth or sixth viewing of the film, and first in half a dozen years. When I was a teenager, the Jerry Bruckheimer style of film was pretty damn cool. I’m not sure if I haven’t aged well or if the movies haven’t aged well, but the result can induce plenty of eye-rolling. I think the most obvious manipulation can be found in the rousing score used at every single moment a non-comedic line is being uttered. I know this went on in THE ROCK and in ARMAGEDDON. I was able to look past the silliness when I revisited the former, and I’ve yet to rewatch the latter since I noticed how annoying the score can be. With GONE IN 60 SECONDS the problem is that the acting, the danger, the drama never approaches what the music would lead you to believe. At least in THE ROCK people were dying and the proceedings felt dangerous. 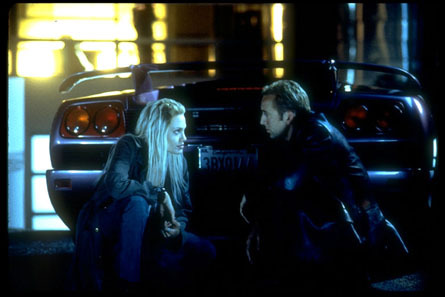 In GONE IN 60 SECONDS that illusion never really lands due to weak villains, big name heroes, and a standard level of predictability. The premise is pretty absurd. Nicolas Cage must steal 50 cars in one night (with the help of his team) to prevent his little brother from being killed. But, frankly, there have been worse plots. It’s all just an excuse to show pretty cars driving fast. And on that level, it works (though it does ignore the fact that they are driving stolen cars through windows without even scratching them). There is a certain level of diminishing returns when coming back to this movie. I still like Delroy Lindo as the detective hounding Cage. I still like seeing Robert Duvall in anything. I still enjoy the chases to a certain extent. Maybe it is because I’ve been watching films like WINTER’S BONE and SHAWSHANK and CASABLANCA recently. Even the more entertaining fare I’ve been leaning on, RAIDERS OF THE LOST ARC or JURASSIC PARK, has been very good this past month of movie viewing. But GONE IN 60 SECONDS just doesn’t really do it for me anymore. It’s all too silly, too forced, too standard. Cage’s career hasn’t been kind to it either. In this post ‘NOT THE BEES!‘ world, his antics play less like deep character revelations. He got the benefit of the doubt in his roles for years because he was that damn good in LEAVING LAS VEGAS. People are on to his game now. He does something irreverent in every movie, sometimes multiple times in the same movie. In GONE IN 60 SECONDS it is in the absurd reaction he has to hearing the song Low Rider. In 2000 this seem cool. In 2012, it feels unhinged from anything else in the movie. Plus the lead in to that scene is one of the worst motivational speeches in recent memory (though that is most certainly the fault of the writing more so than the acting). Maybe it is the fault of the random flames which pop up in the background of a warehouse for no reason. Maybe it’s because the bad guys have such dumb motivations. Maybe it’s because I don’t buy the Cage/Jolie chemistry at all. Maybe it’s because so many team building movies have done it better in the years since this was released. I don’t know. I put this movie on hoping to be entertained. It was slightly above average in that department. And while this isn’t horrendous, this is by no means a good film. I think this can probably sit on my shelf for another decade or so before I dust it off again. ~ by johnlink00 on June 23, 2012.